Currently Eastern Airways (Aberdeen), Aurigny (Alderney) and Blue Islands (Jersey & Guernsey) are also operating daily (reduced at weekends) services, but I think that's it! Everything else is Flybe. "I live close to the flight path for Southampton, not sure i've ever *not* seen a Flybe plane!" Not even a little yellow Trislander?. . . Airline Flybe is to axe its flights from Cardiff to Paris and Glasgow. Services to Paris Charles de Gaulle and Glasgow will be withdrawn from 19 January, and passengers will be offered alternative flights or refunds. However, the airline will still run planned flights to the two destinations for fans travelling to Six Nations rugby matches between 20-24 February. Cardiff Airport said it was speaking to "a number of airlines" about running the Paris and Glasgow routes. The announcement came as the company finalised its summer 2014 schedule, and confirmed it will keep three existing Cardiff services to Belfast City, Edinburgh and Jersey. Paul Simmons, Flybe's chief commercial officer, said: "We have taken a long hard look at all the routes we fly from Cardiff to make sure they are what our customers really want and that they operate at the best possible times for everyone." Cardiff airport chief executive Jon Horne said it was "unfortunate that the popular Cardiff to Glasgow and Paris routes will drop" from Flybe's schedule. He added: "We are already in discussion with a number of airlines regarding the opportunity to pick up the Glasgow and Paris routes, which currently handle 46,000 and 29,000 passengers respectively per annum. Our focus is on securing an alternative carrier as soon as possible in order to avoid any break in service. We will also continue to work closely with Flybe and explore with them other route opportunities from Cardiff as their restructuring process continues." In November Flybe said some of its routes could "possibly" be scrapped after it announced plans to cut 500 jobs. Although it operates services from Cardiff, the Exeter-based airline does not have any staff based there. In October it announced four new direct ski routes from Cardiff Airport to Geneva, Lyon, Chambray and Grenoble. The routes, running from December to April, marked the return of ski destination services at Cardiff after a three-year absence. 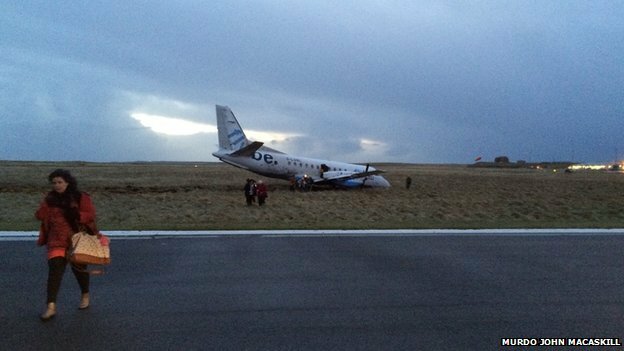 Four people have been injured after a plane came off the runway at Stornoway Airport on the Isle of Lewis. The Loganair service was due to fly to Glasgow at about 08:30. It is thought it may have been caught in strong crosswinds. Police Scotland said two men were taken to hospital and two women received minor injuries but declined medical assistance. A full air accident investigation into the incident is under way. There were 25 passengers and three crew members on board the aircraft. After leaving the runway the plane came to rest on the grass next to it. The Scottish Fire and Rescue Service sent three appliances to the scene. One passenger told the BBC it felt as if the tail was caught by a crosswind. Murdo John MacAskill, who was on board, said: "The plane came down with a bump and we veered far off to the left. I looked out the window and I saw the grass coming up and I knew that there was something wrong so entered the brace position and that's when the plane crashed. We were evacuated from the plane within, I would say, under five minutes. Everyone was standing on the tarmac then and by that stage you had the fire service and the police there." 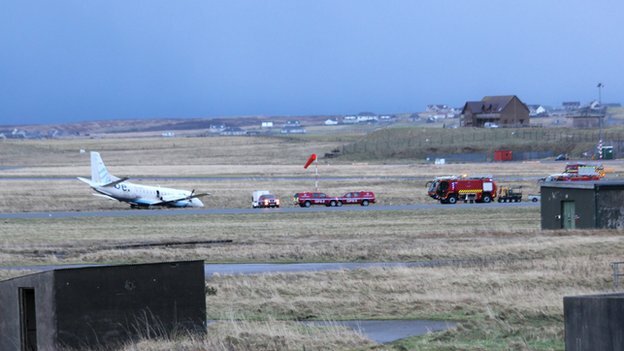 A statement from the airport operators said: "An outbound Saab 340 aircraft operated by Loganair veered off the runway at Stornoway Airport at 8.33am this morning. Efforts to remove the aircraft from the runway are ongoing and investigations into the cause of the incident are under way. It is it our intention to resume normal operations as soon as the aircraft is safely removed from the runway. There are no scheduled arrivals or departures at Stornoway until later this afternoon." A Police Scotland spokesman said: "As a result of the incident two male passengers received injuries and were taken to Stornoway Hospital for further assessment/medical treatment. Two female passengers received minor injuries and declined medical assistance. A full air accident investigation has now been launched and will be carried out by the AAIB in conjuction with Police Scotland." 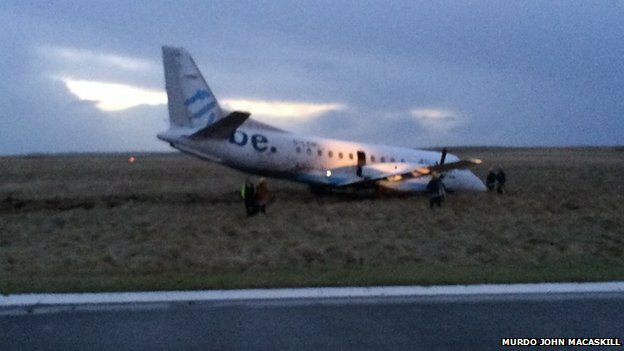 A Loganair spokesman added: "All passengers and crew were safely evacuated and returned to the airport's terminal. Two passengers sustained what we understand are minor injuries and have gone to the local hospital. A full investigation is now under way to ascertain the cause of the incident and the Air Accident Investigation Branch has been notified." 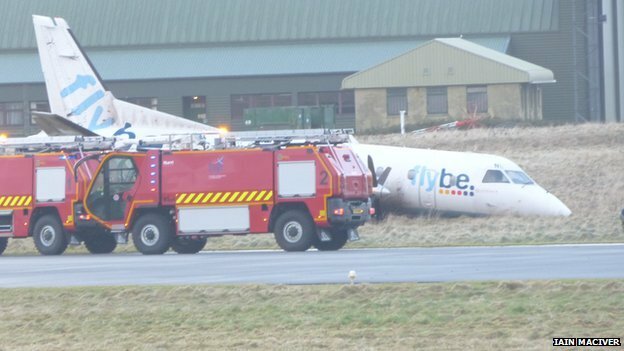 Although a flybe aircraft it was on charter to Loganair at the time of this incident. The aircraft (registration G-LGNL) is owned by and operated by Loganair Ltd according the the CAA register. 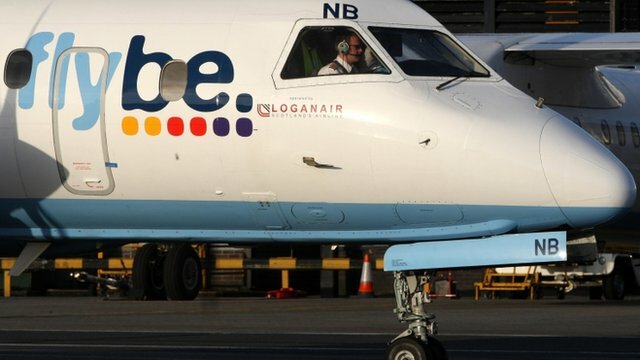 There is a franchise agreement between Flybe and Loganair permitting Loganair to use Flybe's branding and also for the flights to be sold under the Flybe name. Quite so, Brucey - and a commonplace arrangement in the airline world. The paint on the aeroplane, the ticket you buy and the Flight No. may be no indicator of the actual owner and/or operator of the aircraft. The soon to be extinct Virgin Little Red - their A320's are in Virgin Atlantic colours, but are actually owned, operated and crewed by Aer Lingus (under a sub-contract). Nearly all BA flights from London City Airport (except the Club Class only flights to New York) are operated by a Company called CityFlyer Express (under a long-standing franchise Agreement). In other news, the new Flybe Exeter to London City service is to reduce from 3 daily rotations to 2 in February. The airline say they are adjusting the schedule to the demand...for me, any less than 2 rotations a day on a route like this makes it unviable, as the opportunity for day trips is lost. Judging by Flybe's seat reservations in their online booking form, there are at present 57 passengers booked on tomorrow's early morning Exeter to London City flight, with 43 booked on the afternoon return flight (aircraft have total of 70-odd seats) so there's clearly a demand for a commuter-style service. It would be very interesting to know where these passengers have travelled from, are people driving from Plymouth for example? And also how many might have used the train if no flights were available? Haven't seen this posted elsewhere. As predicted by some contributors to this forum the Flybe Exeter <> London City service has, seemingly very quietly, been reduced to a single early morning EXT > LCY & early evening LCY > EXT schedule making a same day trip from London to Exeter impossible. What odds on the service being withdrawn completely in the not too distant future? Unsurprising frankly - why would *anyone* traipse all the way to LCY, go through security etc, fly & get from the airport to city centre when you can get hourly trains from PAD that drop you a hell of a lot closer to where you want to be without any hanging about? I've had to go to central Glasgow a couple of times in the last month. The first time I went I did the entire journey by train - from Thatcham to Glasgow via Euston. The journey was comfortable and on time but sooo long. This last time I decided to fly from Gatwick for various reasons. So if I have to do this again I don't know which I would choose. I have flown from LCY before but to me there are more facilities at Gatwick and Heathrow is just too expensive. I have a work colleague (lives in Exmouth) who quite regularly uses the EXT-LCY for day trips, and it seems to work for him, and is often cheaper than the train. LCY is about 20mins by DLR/foot from our City Office.